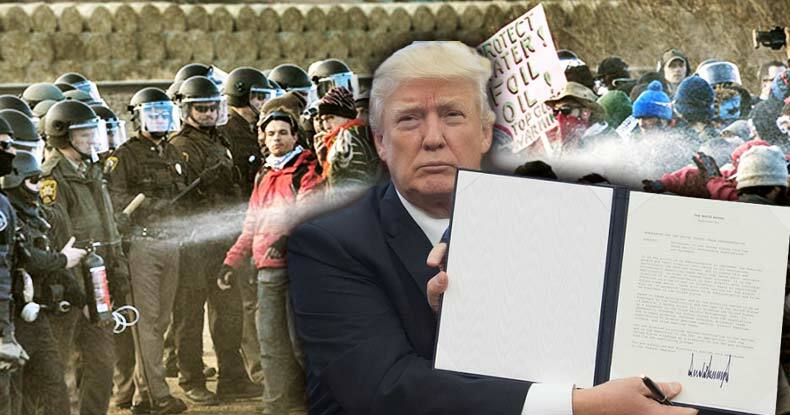 In a move that is sure to cause a firestorm of controversy, Donald Trump signed Executive Orders at 11 a.m. EST, advancing the Dakota Access Pipeline as well as the Keystone XL. According to Reuters, U.S. President Donald Trump signed two executive actions on Tuesday to advance construction of the Keystone XL and Dakota Access pipelines, an administration official said, rolling back key Obama administration environmental policies in favor of expanding energy infrastructure. The entire substance of the executive order was not made immediately clear. However, they will fulfill campaign promises Trump made to approve both pipelines — which have been vehemently opposed by a massive bipartisan sect. This news comes on the heels of a pipeline spill yesterday, which dumped hundreds of thousands of liters of oil on an aboriginal community in Canada. As the Free Thought Project has reported, this move by Trump has been premeditated since the election. It is most likely why the company behind DAPL, Energy Transfer Partners, said in December, the denial of an easement necessary to drill under the Missouri River is of no consequence for its plans to complete the project. The incoming administration already stated its support for the project and the courts have already stated twice that it appeared the Corps followed the required process in considering the permit,” said Senator Heidi Heitkamp (ND) in a statement last month. It now appears that these plans have made their way to official White House ink — and DAPL will continue as planned. This executive order by Trump seeks to override the decision by the Army Corps of Engineers who refused to grant permission to extend the Dakota Access pipeline beneath a Missouri River reservoir last month. As the Free Thought Project has previously reported, the DAPL is set to go over lands which do not belong to the Federal Government as they were usurped by the state’s violation of Native American treaties. As for TransCanada Corp.’s Keystone pipeline, that was also rejected under former President Barack Obama. However, this move was seen by many as a seeming giveaway to Warren Buffet who holds a quasi-monopoly on train-based oil transportation through the same region. Once news of the Executive Order broke, TransCanada stock climbed as much as 1.1 percent to C$63.25 at 9:33 a.m. in New York. Energy Transfer Equity LP and Energy Transfer Partners LP climbed as much as 3.3 percent and 1.7 percent, respectively, as reported by Bloomberg. Donald Trump, prior to being elected to POTUS, had investments in Energy Transfer Partners. According to CNBC, in December, he sold his entire stake in the company as ownership in it could be perceived as a conflict of interest. This move will likely be met with more protests and even more police violence.